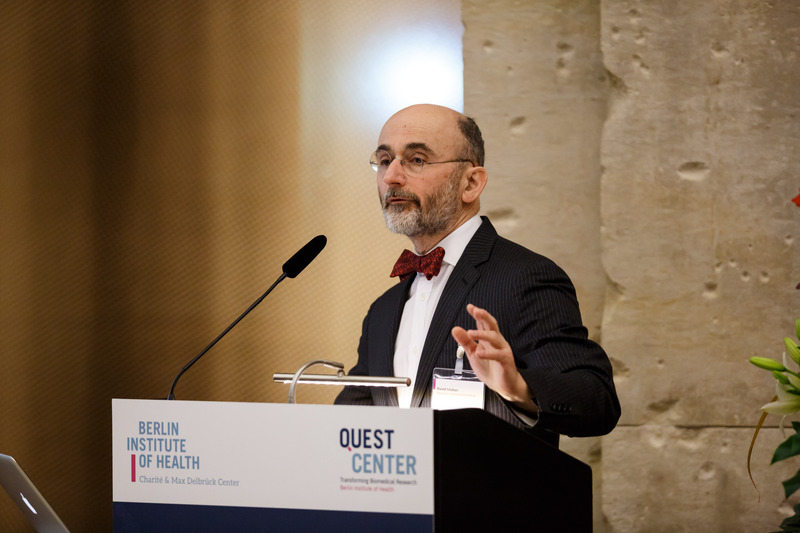 The QUEST center at the Berlin Institute of Health celebrated its opening with an international symposium. A diverse cast of speakers outlined current challenges in the scientific process and a possible roadmap to transform biomedical research. Trish Groves (Director of academic outreach at BMJ and Editor-in-Chief of BMJ Open) spoke about the meaning of open science, and the ways in which our journal has taken steps to “open up” science, such as open-access content, open-peer review, valuing quality over novelty, and publishing registered reports. “Why are we allowing this to go on for a century?” asked David Moher reflecting on the shortcomings of the scientific (publication) system. Only five minutes into his keynote lecture at the opening of the QUEST center in Berlin, he was already at the heart of the problem and mapping the mission of QUEST – Quality, Ethics, Open Science, and Translation. With evidence accumulating that a significant amount of findings in biomedical research are neither reproducible nor replicable, Moher calls for a behavioral change of scientists. QUEST founding director Ulrich Dirnagl, an experimental stroke researcher, emphasized that “shoddy preclinical research is not just bad science – it is unethical” as he and Mark Yarborough previously state in their correspondence article. The following talks at the two-day opening pointed out major causes of this dilemma: insufficient data sharing, lack of education in peer review, gender biases in animal research, bioethical concerns, and missing incentive structures for scientists to conduct robust research (all talks are linked below). One of the most pressing questions emerging from this meeting was, given the huge agenda, how will the newly established QUEST center initiate the transformation process. Situated at the Berlin Institute for Health that orchestrates the translational research between the Max Delbrück Center for Molecular Medicine and the Charité University Hospital, the QUEST center has a unique opportunity to facilitate change in a landscape that comprises approximately 4500 researchers and clinician scientists. This will happen through infrastructural and service support for example by rolling out electronic lab books to replace paper versions. Educational programs will target medical students to principal investigators to remove technical and knowledge barriers towards reproducible research. On a policy level, new incentive structures will encourage replication, reporting of null results, and open access publishing. Criteria for tenure and new appointments need adjustment to reward good scientific practice. Importantly, meta-research on the scientific output of the Berlin Institute of Health will help understand to what extent the planned measure were successful. Through these measures, QUEST will hopefully grow into a landmark testbed for how to increase value and sustainability in biomedical translational research. Daniel STRECH (Hannover Medical School) – Effective and efficient bioethics of translation! How to?